Handbook of Naturally Occurring Compounds, Volume I: Acetogenins, Shikimates, and Carbohydrates contains most of the known naturally occurring compounds and their corresponding structures, classified into acetogenins, shikimates, and carbohydrates. Each structure includes the molecular formula, molecular weight, optical rotation, melting point, literature reference, and classification number. 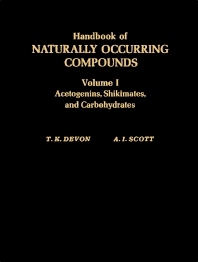 This handbook is comprised of nine chapters and begins with an introduction to the primary classes of naturally occurring compounds to be discussed in the following chapters, namely shikimate aromatics, acetate/shikimate aromatics, acetate/malonate aromatics, acyclic and heterocyclic acetogenins, carbohydrates, and complex classes. The shikimic acid pathway is described, along with the oxygenation patterns of shikimate-derived aromatics. Compounds such as lignans, terphenyls, macrolides, and miscellaneous phenols are considered. Oxyheterocyclics related to the linear acetogenins/phenylpolyynes are also analyzed. The final chapter provides three indices in addition to the structural guides, namely, Molecular Weight Index, Molecular Formula Index, and Alphabetical Index. This volume will be a useful resource for chemists and chemistry students.